OrangeX Commercial - Citrus Press / Juicer - juices oranges, grapefruits, lemons, limes and more! DUE IN 5/15 This item is currently out of stock. We have the black color in stock. This professional juicer is easy to use and clean. It quickly and gently extracts juice from oranges, tangerines, lemons, limes and medium sized grapefruit. Simply place half a citrus over the stainless steel funnel, lower and push down on the handle to enjoy 100% natural juice. Bitterness from the pith, as well as the pulp and seeds, are left behind. The juicers is made of high quality cast iron with a large, nonreactive stainless steel strainer and basket. Features an extra-wide base for stability and oversize grip handle. 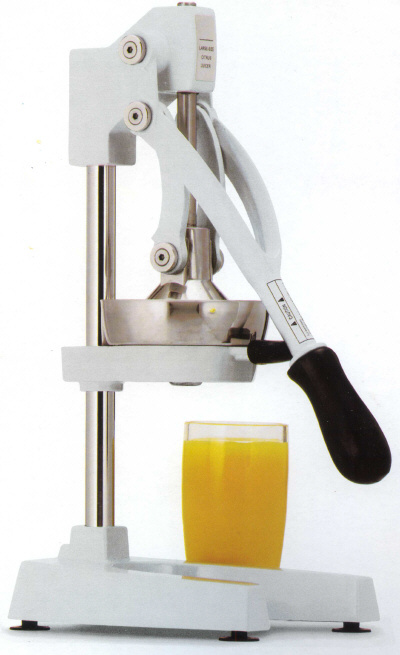 Boasting a patented lever mechanism that is superior to the rack and pinion gears and 25% more juice capacity than comparable product the OrangeX is our juicer pick for the citrus juicer category. Over 90,000 sold in South America. What's the difference between the Jupiter Household and Olympus Commercial Model? We have used both units, and they work exactly the same. The household unit is a bit smaller, and will require that you use about a 4" tall cup to catch the juice when it comes out of the juicer. The commercial unit is a bit more heavy duty, it weighs a few more pounds, and is a few inches taller, and allows you to use a taller glass, that is about 6.75" to catch the juice. Both the household model and commercial model will accommodate up to 4" diameter fruit. If you have larger fruit, you may need to quarter the citrus fruit so you can juice it. "What are your favorite kitchen tools?" parts that are hard to clean." December 2000 issue p.p. 40. OrangeX juicers use no electricity, are extremely easy to use and appeal to consumers who know that fresh-pressed juice provides superior taste and health benefits. Note: may not fit under counters. Please measure before ordering if this is a factor for you. Please note: The name of this juicer has been changed to the Olympus. It is made in the same factory as the OrangeX and is identical to the OrangeX except for the name. Making juice with the OrangeX is as easy as 1..2..3..